Hot-applied repair system for corrosion prevention coatings on pipes and pipelines. For operating temperatures up to +90°C (+194°F). Compatible with factory coatings made of PE, PP, FBE, PU and bitumen. Fulfils the high-temperature ageing standard ASTM D 638 (168 h at +150°C [+302°F]). Outstanding lap shear strength and peel strength. 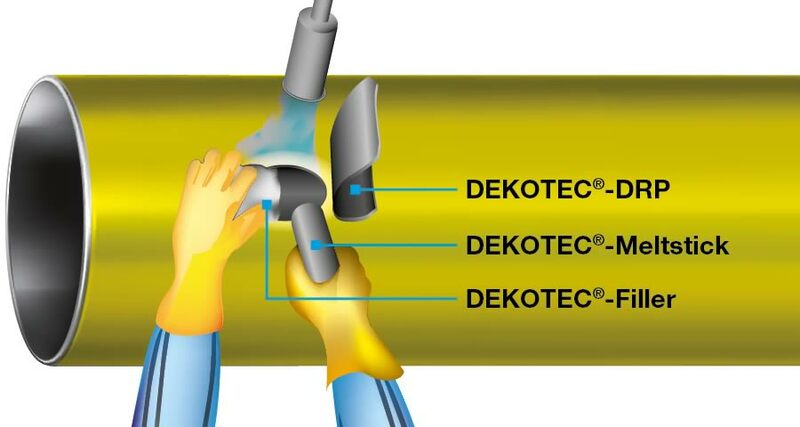 DEKOTEC®-DRP, DEKOTEC®-Filler and DEKOTEC®-Meltstick are repair solutions for damage to the corrosion prevention systems of pipes and pipelines. DEKOTEC®-DRP, DEKOTEC®-Filler and DEKOTEC®-Meltstick are part of an exceptionally economical hot-applied system that guarantees a high quality repair of factory coatings. The DEKOTEC®-DRP, DEKOTEC®-Filler and DEKOTEC®-Meltstick system can be applied quickly without any special tools, and has successfully proven itself in extreme climates all over the world as a defect repair solution for factory coatings on pipes and pipelines. The DEKOTEC®-DRP, DEKOTEC®-Filler and DEKOTEC®-Meltstick system is resistant to the abrasion and peel forces that pipes and pipelines are subjected to during installation and operation. DEKOTEC®-DRP, DEKOTEC®-Filler and DEKOTEC®-Meltstick complete your permanent and durable corrosion prevention solution.